Spotify for BlackBerry has finally made it out of beta and is available on all compatible BB handsets, unfortunately that list of compatible handsets is somewhat limited. Spotify has been making its way to any platform it can this year with Facebook integration as well as apps for Android, iOS, Windows Phone, Symbian, and even Palm. And, now it finally has a BlackBerry version as well. Spotify for BlackBerry was first released as a beta app back in October, but has left beta status and is available for all compatible handsets. Unfortunately, compatibility is very limited, only working on GSM handsets. And, the app has only been tested and can be confirmed as working on 5 devices: the 9780 Bold, 9700 Bold, 9300 Curve, 9000 Bold, and 8520 Curve. 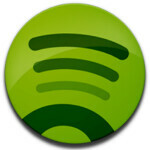 If you want to give it a try, just point your BB to m.spotify.com, and you'll get a 48 hour free trial. Of course, after that you'll need a Spotify Premium account which will set you back $10 per month. spotify is the #1 music streaming service in Europe, they recently came to the states this year. Only bada still left out in the cold.